What a great news today! 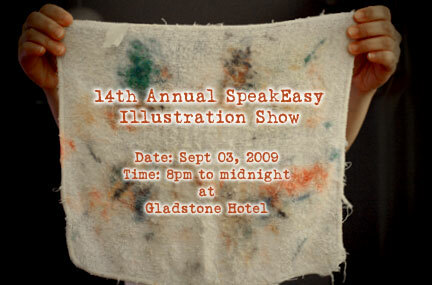 I have been selected to be part of the 14th Annual SpeakEasy Illustration Show. This year they chose 30 illustrators in the exhibition, each of us has assigned a wall to display our works. The show is not big, and it is only last for 4 hours, but it does mean a lot to me. It means that my work is recognized by some professional artists. It means my hard work is paid off. It means I made a step forward on my journey. It means more hard work will be coming in the next few weeks. It means exciting, happy, rewarding, and valuable. It means evaluation, improvement, persistence, and passions. When I started taking courses, I picked up a new habit of using wet towel to clean my brush. I feel this way is more environmental friendly that using paper towel. Here is my 2nd towel in 3 months, looking at this towel tells me that I'm actally constantly working hard.